Libyan rebels battling Muammar Gaddafi’s troops along the country’s Mediterranean coast said they have captured all of the strategic eastern port city of Brega. Rebel military spokesman Colonel Ahmed Bani said fighters gained control of the industrial section of Brega, after having captured its residential areas last week. Brega’s capture is an important boost for the rebels. It contains Libya’s second-largest hydrocarbon complex and is where the country’s main oil fields feed into for refining. 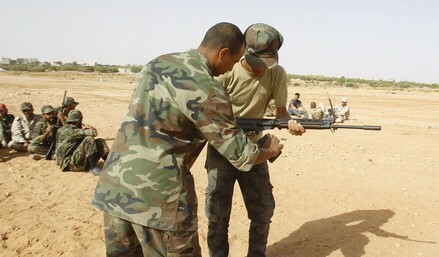 The clashes with Gaddafi forces killed two rebels and left fifteen injured, according to rebel spokesman Mohammed Idris. His claim could not be immediately verified and officials in the Libyan capital Tripoli made no comment on it. Brega is a wide strip of desert made up of two residential sections about six miles apart, followed by the oil refineries near the port on the Mediterranean Sea. Brega, about 125 miles south-west of the de-facto rebel capital of Benghazi, fell under rebel control briefly in March, but was recaptured by Gaddafi’s forces shortly afterward. The fighting around the city has gone back and forth since then, with the rebels struggling to keep their ground. Rebels are closing in on Gaddafi, pushing back his fighters in a fierce battle in one key coastal city and seizing another town as they advanced toward his remaining bastion: the capital, Tripoli. The territory remaining under Gaddafi’s control has been shrinking dramatically in the past three weeks, with opposition fighters moving closer to Tripoli, from the west, south and east. At the nearest point, rebel fighters are just 30 miles west of Tripoli, in the coastal city of Zawiya, where battles raged on Friday over control of the city centre. Gaddafi’s forces pounded rebel-held areas of the city with rockets, mortars and anti-aircraft fire, but by nightfall were pushed out of a multi-storey hotel on the square. Nato’s bombing campaign has made it difficult for the regime to send massive reinforcements to Zawiya, enabling the rebels to maintain a hold over much of the city, their biggest prize in months.